Oh the things you can learn from the New York Times! Today's lesson: A maggot or two never hurt anyone. An opinion piece printed this morning turned my attention to a vomit-inducing pamphlet produced by our very own US government. The title is too boring to print here, but the purpose of the pamphlet is anything but dull. It's meant to list the contaminants allowed in various food products. What contaminants, you ask? Well here's just a short list . . .
A 100 gram container of Apple Butter is allowed to have up to 4 rodent hairs, a mold count of 12%, and 5 whole insects ("not counting mites, aphids, thrips, or scale insects"). Yum! Pizza sauce can contain up to 30 fly eggs, while the oregano used to add a little extra flavor can contain up to 1 milligram of "mammalian excreta" (yeah, that's right) per pound. And you might want to pass on the mushrooms as well. 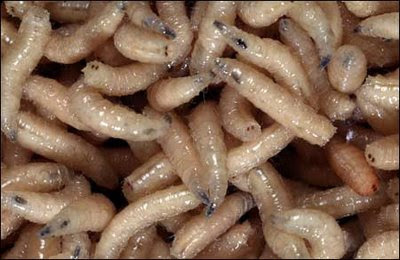 A 100 gram sample is allowed up to five maggots, two millimeters or longer. According to the Times Op-Ed Piece, "You’re probably ingesting one to two pounds of flies, maggots and mites each year without knowing it." So glad instant pudding wasn't mentioned in this particular post, as I am eating it right now. Oh my freakin' god! Oh well, nothing like getting down and dirty! So... vegetarians can't eat these things? So it's okay that I ate that insect? ._. my friend ate a chocolate covered cricket once. she said that it tasted like a crunch bar. My brothers eat bugs, like, as a hobby. Bluhk! Right now, we have raw honey, which is full of bee wings and wax and junk. It's okay on, like crackers, but it's nasy in tea. That is dicusting. Here is a question: why WOULD anyone alow this? im sure it does not save anyone money. If it does, I dont think it is worth it. EWWW EWW EWW EWW EWW EWW! even though that's completely disgusting, I'm not REALLY surprised. The only thing that really would bother me would be maggots and rodent hairs. Mold and bugs to me are just a fact of life. But I am sooo glad I almost never eat canned foods (besides soup, and for cooking purposes) because most of that stuff was canned. 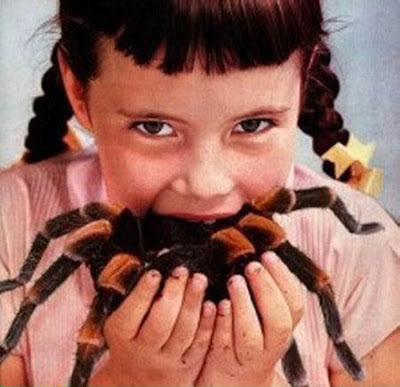 That is the grossest- and weirdest-thing in the world. But I got to say, PRETTY AWESOME! Anyone with me? No? oh well.